Alive and Well and Living in France: Supersize Me!! I supersized my Nutella! 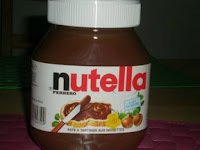 !This is quite embarrassing actually that I would buy this size Nutella, but I couldn't resist! !The French don't have much in the way of "supersizing" things, but this is too funny!! Believe it or not, Nutella is actually a recommended breakfast choice as part of a balanced and NUTRITIONAL meal - Vive la chocolat!! It's good to know you're doing well. We definitely miss you. Not much is different here. Maddux just started doing the bike thing without supervision around Mt. Vernon. Big step for him. Are y'all traveling outside and inside France much? How are the girls adjusting. Are they able to speak and learn the language? What a great experience for them. Well,I gotta run but I wanted to say hello and that we miss ya!